“Picture the farmer of one hundred years from now. Discard the image of a sun-baked tractor driver with grime under his fingernails and mud caking his boots. 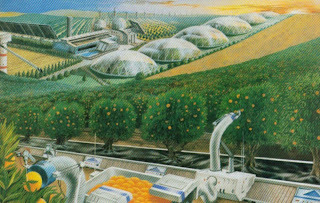 In the future world of agriculture, technical expertise, scientific knowledge, and computerized, robotic equipment may be far more important than the hard work and muscle power that farming traditionally required.” That is how The Future World of Agriculture starts, an EPCOT Center book written by Wendy Murphy, begins. 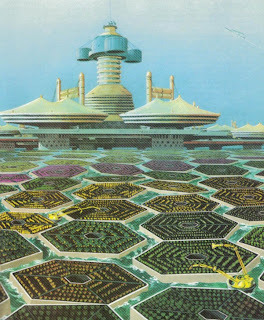 In the finest tradition of writing, it is definitely enough to keep the reader wanting to know more, and it delivers with a look not only at the future of agriculture, but its past as well, and a detailed documentation of EPCOT Center's The Land pavilion. Growing up, my father had such an overwhelming fondness for Listen to the Land, now Living with the Land, that no matter how short a trip to EPCOT Center was, we had to board one of the boats and take a tour through the greenhouses. Couple that with the fact that my mother has had a vegetable garden every year, no matter how small our yard was, for as long as I can remember, and only then does my love of everything green, flowering, that sends out roots, or that is fruit bearing begin to become understandable. The ideas of future crop growing presented in The Future World of Agriculture are as sound as they were in 1984 when the book was published. And though a great many strides have been taken in the field of agriculture since then, many of the theories presented in the book, and in The Land greenhouses, are still in developmental and experimental stages. The Future World of Agriculture offers two very intriguing and useful tools for those interested in horticulture. One, a glossary filled with terms that make the processes of agriculture more available to the masses. 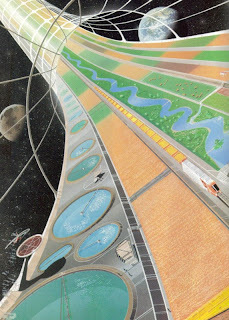 And two, fantastic concept art that showcases what the future world of agriculture could potentially look like. To close today, let’s take a look at a few of the vital terms and the inspiring images of The Future World of Agriculture. Closed-System Farming – Farming in which a variety of crops are grown on a relatively small farm. Each crop is scientifically selected to be environmentally beneficial and the contribute to the farm’s overall needs. Integrated Pest Management (IPM) – A system of controlling rather than eliminating plant pests, such as insects, weeds, and pathogens, through a combination of biological, physical, and chemical controls. Intercropping – A technique for growing two or more crops side by side in alternating rows. This technique can result in improved soil fertility and increased crop yields. Plant Growth Regulators – Artificially produced chemical equivalents of the natural substances called hormones. Growth regulators are used to produce more desirable performance in a plant, for instance, to make crops bigger or faster or ripen all at once.